For some people, there’s always a reason not to do something. Outside entrepreneurial circles – or at least to those who don’t hang around with individuals with a “growth mindset” – the colossal success of others can sometimes even undermine their motivation. The sad fact is that while many will be impressed by the success of another’s company, they will often use this as evidence that their own unique circumstances render any attempt to replicate such a journey futile. So the argument goes – why try to follow in X’s shoes? X was a company in the right place, at the right time, that delivered a solution that people needed and were willing to pay for. The market’s now moved on, looking elsewhere, for people other than me to help them. That doesn’t seem to present in the PayPal company ethos however. Now, we hear a lot about PayPal in the Bitcoin world. About how it can’t possibly replicate the benefits that Bitcoin provides given the fact that, when all’s said and done, it has always been, and always will be, a third party. But that’s not the point of this post. And when you’re sitting within that crypto echo-chamber, it’s far too easy to discount the progress that has been made by previous trailblazers in their day. It’s easy to forget precisely how successful – and important – PayPal has been to the tech ecosystem over the past number of years. Just take a look at that diagram and see just how many of the people who were closely connected with the business moved on to build really significant companies. TechRepublic published a great list of some of the most impressive companies and organisations that were formed after individuals moved on from PayPal. I’ve blogged about that niche club of billion-dollar unicorns. It’s not an easy club to gain access to. 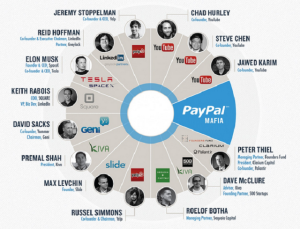 But somehow the so-called ‘PayPal Mafia’, a team of only 220 people created no less than 7. Incredible. That’s a huge list. 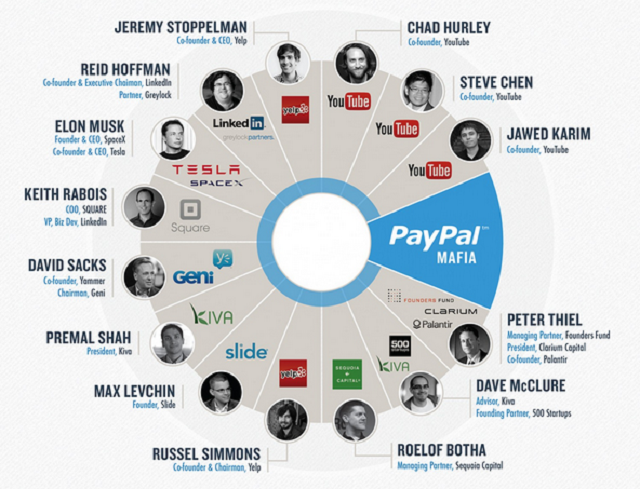 And that’s just the most successful businesses that were created by PayPal individuals in financial terms. There are many more that aren’t even on that list that have also become significant parts of the wider tech ecosystem. Did the company culture somehow create that success, moulding individuals in a way in which success was more likely whatever they chose to turn their hands to after leaving the business shortly after eBay snapped it up for $1.2 billion? Or were these people just born winners from day one? Interestingly, I’ve read a number of articles that mention the fact that friendships were very strong in the business. Of course, friendships are far easier to build, I suspect, when things are going well than you’re in a startup that’s continually teetering on the brink of insolvency. But the strongest bonds are always forged under the most intense pressures. I’m sure that successfully working on a rocket ship that’s flying faster every day is a ‘better’ sort of pressure out of the two to choose. It’s just like the 4-minute mile story I guess. Thought to be impossible, as soon as Roger Bannister showed the world that it could be done, the floodgates opened in the following years. PayPal’s a pretty extreme example but I suspect it’s true – choose your work colleagues carefully.